Chas Alecxih (Class of 2007) came back to Central Manor Elementary to visit his former teachers and inspire the current students. During Shine Time, the all-school assembly, Chas told the students to follow their dreams because anything is possible. After graduating from Penn Manor, Chas went on to play football at the University of Pittsburgh graduating in 2012 with a Bachelor’s degree in Communications. He is currently on the roster as a defensive tackle for the Miami Dolphins. 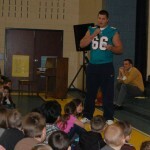 Chas encouraged the students to be determined, work hard in school, and have a good attitude. 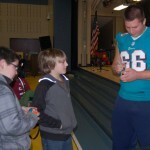 After the assembly, he signed autographs including shoes, shirts, and Dolphins merchandise and spoke with a smaller group of sixth grade students about his experiences as a rookie in training camp.